Śrīla Bhakti Rakṣak Śrīdhar Dev-Goswāmī Mahārāj describes his first attraction to Śrīla Bhakti Siddhānta Saraswatī Ṭhākur, as well as his continued engagement with his divine message. Śrīla Bhakti Siddhānta Saraswatī Ṭhākur’s praise of his disciple Śrīla Bhakti Sāraṅga Goswāmī Mahārāj. 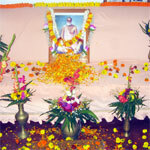 Principles taught by Srila Bhakti Siddhanta Saraswati Thakur. Are karmic reactions the Lord’s mercy? Srila Bhakti Siddhanta Saraswati Thakur concisely explains. This morning Srila Bhakti Nirmal Acharya Maharaj led a full programme of glorification for Bhagavan Srila Bhakti Siddhanta Saraswati Thakur in Nabadwip.